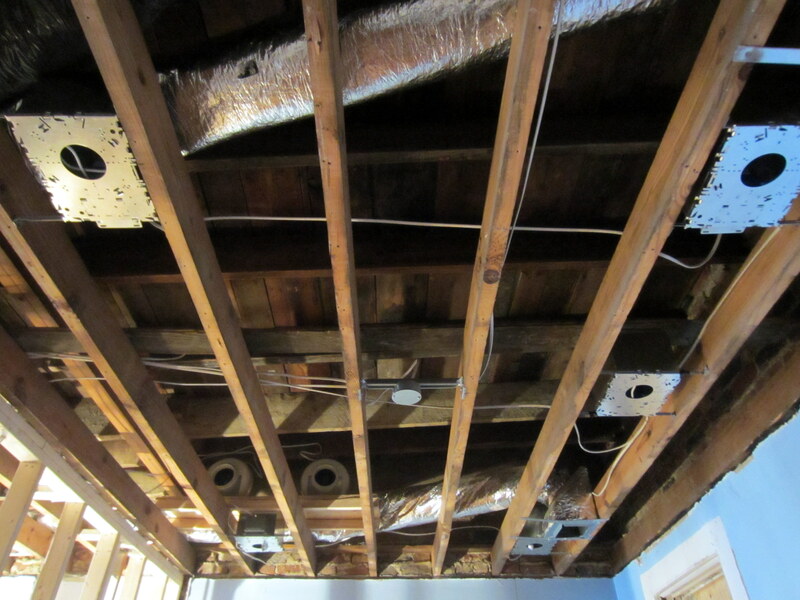 The exposed-infrastructure stage of home renovation is drawing rapidly to a close. Insulation and drywalling activities are looming (they’re actually already here, it’s just that our posts are woefully behind), and it’s time to take a final look at the exposed house elements before they’re forever entombed. 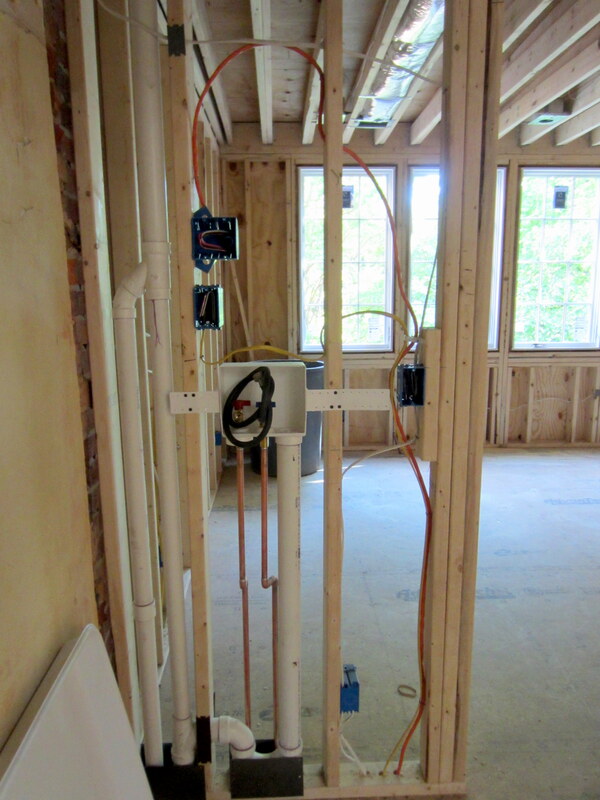 On the second floor, there’s a mess of plumbing, electrical, and mechanical elements in the utility closet between the hallway and the master bedroom. The placement of the air handler on the top floor (consistent with the pre-reno house) helps in AC distribution and minimizes the distance between this component and the compressor directly above it on the roof. The utility closet also will house stacked, front-loading washer and dryer. The blue spot on the floor in the photo above is one end of the emergency drain line that exits directly from the side of the house in case the washer has an issue. 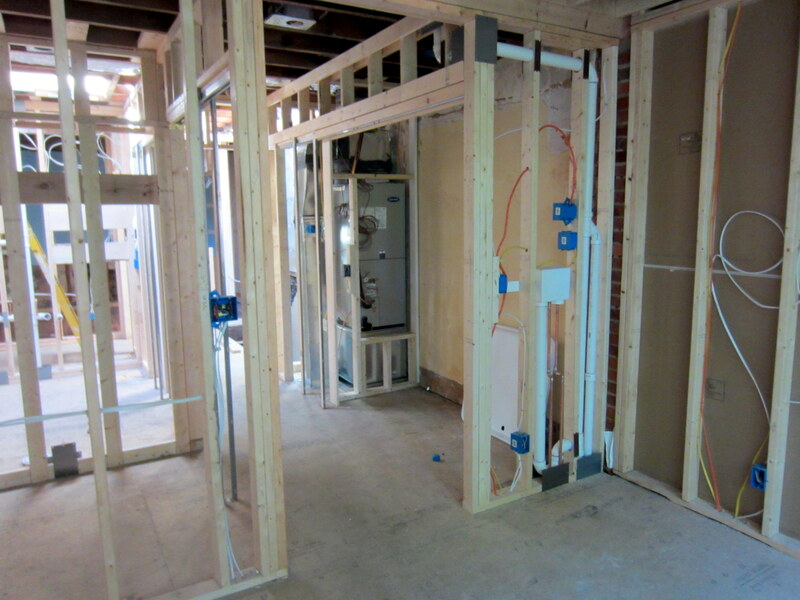 Rough-in electrical and plumbing occupy the south wall of the utility closet for the washer and dryer. 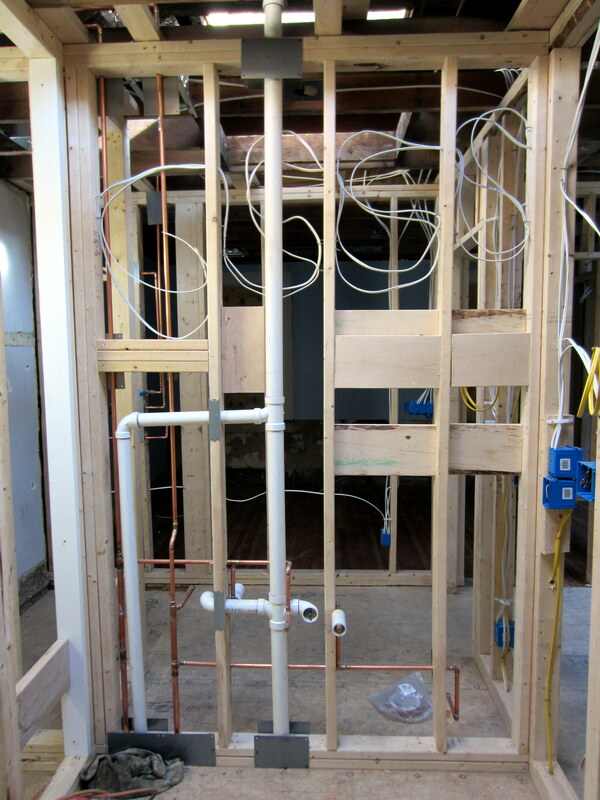 The wall between the two upstairs bathrooms house all of the plumbing supply and drain lines and electrical rough-ins. 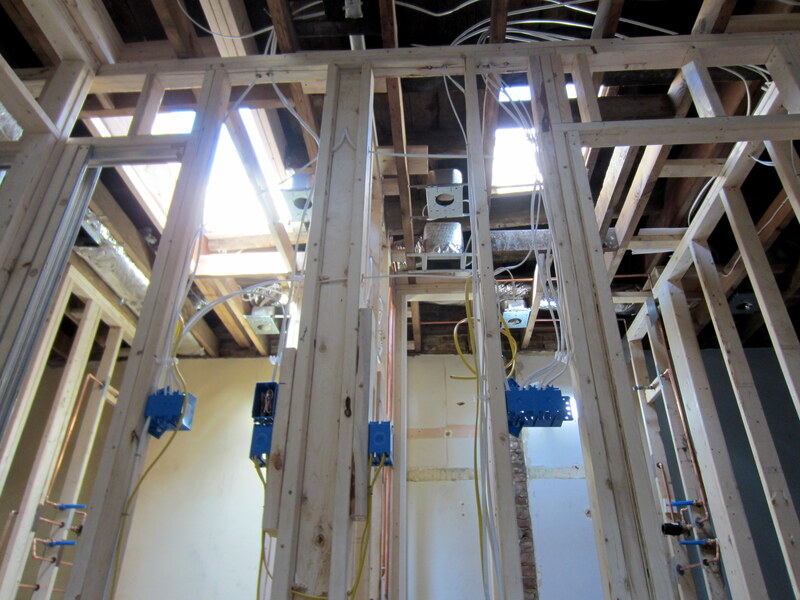 All of the extra wiring supports subsequent pendant lights in the master bath and sconce lights in the guest bath. 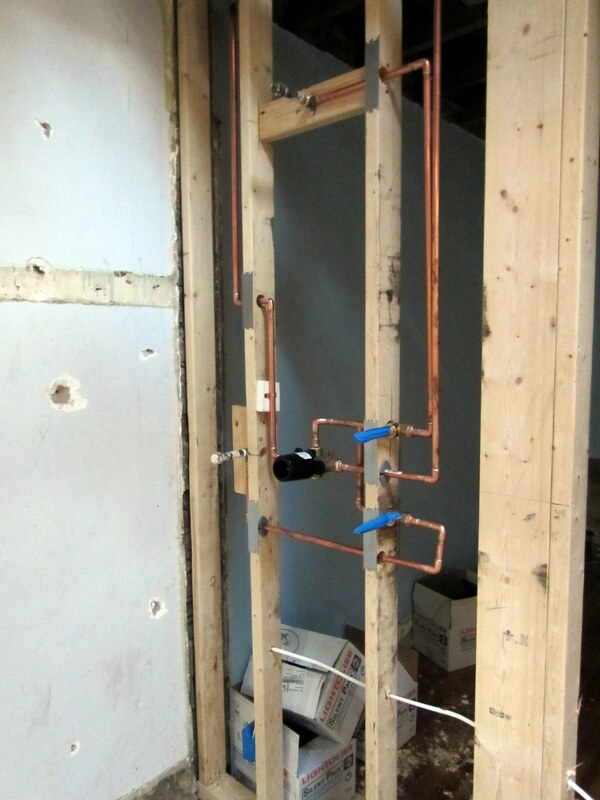 The plumbing rough-in for the two bathrooms is identical: supply lines for flow control valves and fixtures for shower heads and hand-held showers and a thermostatic controller that supports both. 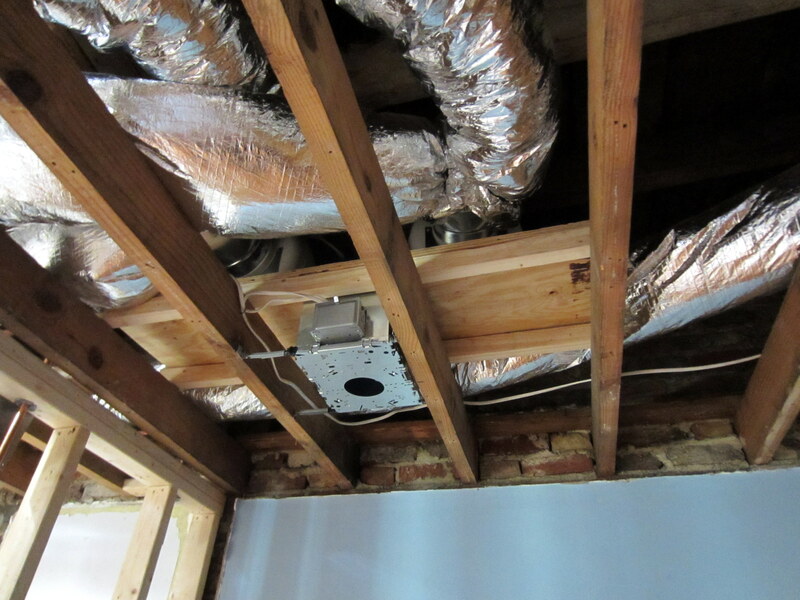 In-line fans mounted above the guest room rafters support both bathrooms. Because of the floor-to-ceiling glass doors on the showers, we need to vent moist air, and these remote fans take care of this nicely. The GC wanted to install routine bathroom ceiling fans, but this approach supported both showers and bathrooms, and were super efficient, so we went with this approach, spec’d by our first architect. A subsequent picture of the fans appears below, after the insulated vent lines have been attached. 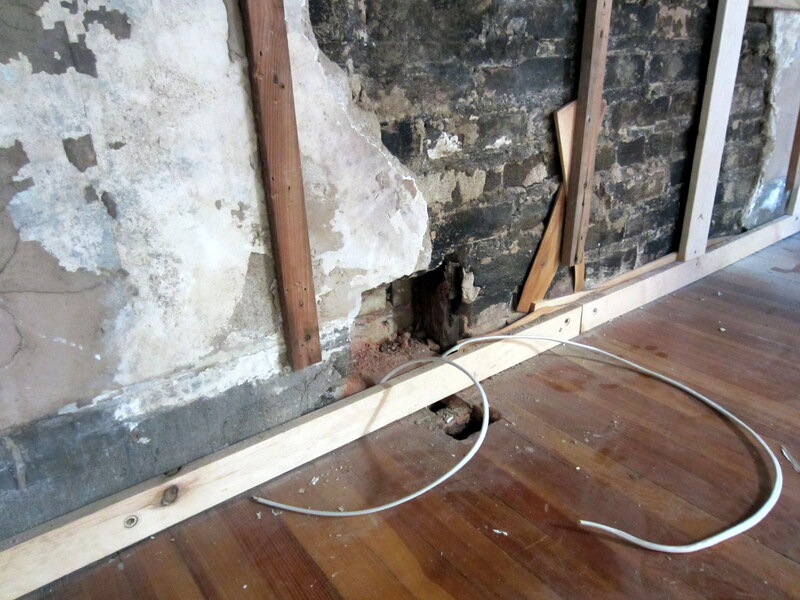 Electrical rough-in also had to contend with solid brick exterior walls in much of the house. The result was a collection of new pockets in the brick to accommodate electrical outlets that will poke through the baseboard in the guest room, pictured below, and all over the main floor, the subject of the next post. Both links are dorky as hell, but highly informative!